I did this over a week ago, but I’m just now blogging it. Bad blogger! 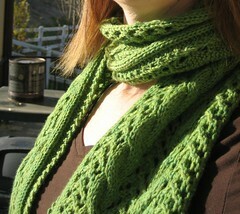 I finally got around to writing up the pattern for the Chicabean Scarf. I wasn’t going, but I got a couple of requests and is was pretty easy since I’d already done that hat. I really love both of these patters. 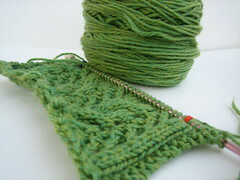 I’ll definitely be knitting more cables and lace combos! My sister picked out this yarn a long time ago, over a year ago. 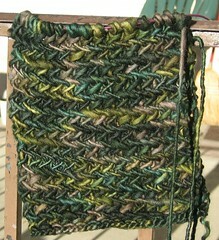 It’s one Cascade 220 “Heathers” colors, green with some bright blue and yellow mixed in. I’ve been looking for the “perfect” pattern for it. 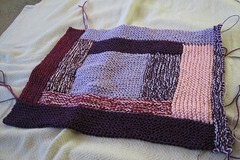 I finally gave up and made one based on a stitch pattern the Big Book of Knitting Stitch Patterns. At first I wasn’t sure and I think this is the third attempt, but I love it! Cables and lace wow! I want to do more of this combo! It will be warm without being dense. Plus the pattern was interesting enough to keep my attention, but easy enough to memorize. I’m really happy with it and I hope the recipient loves it as much as I do! I made a matching hat for it that will be the feature of tomorrows post. As much as I love the scarf I think I love the hat more. I’ll be making one for me soon! Let’s get the new project I’ve cast on for out of the way first – My So Called Scarf! Isn’t it like mandatory that if you’re a knitter you buy Manos and make this? 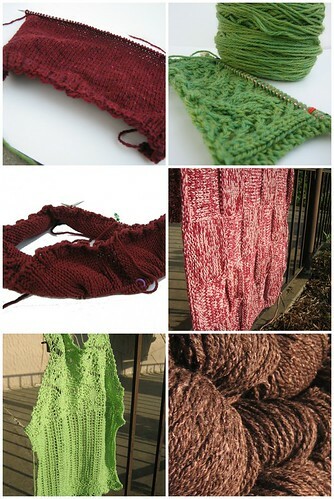 When I was browsing Ravelry for what to do with my skein of Manos in Prairie this is all I saw. Er, yeah you’re right, that’s not Prairie, that’s the new Manos I bought yesterday specifically for this scarf, I bought two skeins and I’m alternating every two rows with them because I saw so many people say their two halves didn’t match exactly. Up next another scarf, the Chicabean Scarf, I’m so pleased with the cables and lace pattern on this. 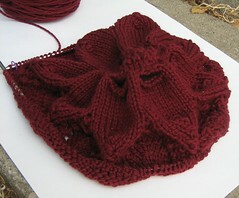 It’s Cascade 220 so it will be a warm scarf even with the lacy holes I’m also planning to adapt the pattern for a hat. I’ll let you know how it works but I don’t think I’ll have any problems I’ve already worked out the decreases in my head. Tree Jacket is coming along nicely. I’m getting ready to switch to stockinette on the first sleeve. I’m happy I decided to use the lace pattern on the arms, I like how it looks. 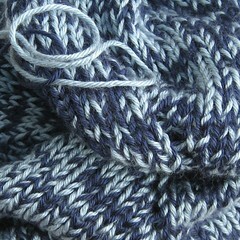 I’m knitting it in the round, so there is lots of turning of the body! wow! You’ll notice I haven’t bound off the body yet, I want it to be long but I wanted to be sure I had enough yarn for the arms, so I’ll finish it after the arms are finished. I’m also still working away on the Melon Pattern Scarf , it’s lace so it’s slow going but my love for it has not diminished. Love the silk, love the colors, love the pattern. Initially I wasn’t going to add the border to it, but now I’m thinking I will. The Lace Tank is on hold. Here we are for another installment of WiP it Wednesday where I publicly admit the new projects I’ve started (I have a serious case of startitis I want to start at least 2 more but I’ve been restraining myself) and show the projects I’ve been neglecting. See where the shame comes in? For me at least, for you guys it’s good you can point and judge and whisper among yourselves. 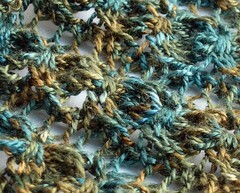 Up first the Melon Pattern Scarf from Victorian Lace today. I love this, I love the pattern and I love the yarn, it’s like they were made for each other. 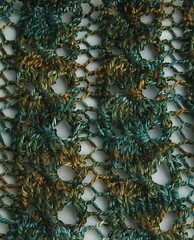 I know variegated yarn is frowned on for lace but I like it. 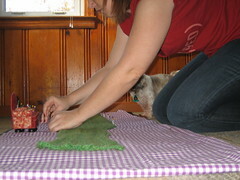 I’m not planning to put the edge on it just block lightly and go! Next the Hemlock Ring Blanket I haven’t picked this up in a week. Not for lack of love, I definitely love it. But it’s not portable and I’ve got a couple of other big projects I’m trying to finish and I’m a bit distracted so I can’t focus enough to work this pattern. Here we have the Simple Log Cabin Throw that I snuck in without even putting it on my side bar. 🙂 I have two nieces, one will get the throw I showed you last week, one will get this one for Christmas. I’m about half way done with this. I’m still working on The Chicabean Scarf, but no new pics because I know the recipient reads the blog so it needs to be sort of a surprise. She did pick the yarn so she knows she’s getting something. 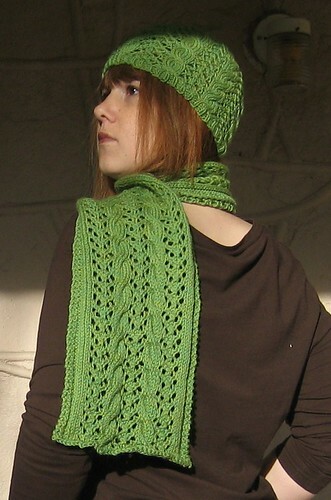 I love the pattern I’m using for this one, and I’m planning to adapt it to a matching hat. They’ll be Christmas gifts too. Then that’s the end of my Christmas knitting unless I do something small. The Pinwheel Blanket also intended as a gift. My mom said the best baby blanket she got was circular so I found a pattern for one. The Lace Tank – it’s hibernating. It’s hard to focus on a lace top when the weather is cooler and I’m itching to knit sweaters. Picovoli – Not really hibernating I just haven’t been working on it but I will. Oh and one last wip, which really barely qualifies. I have one ball of manos and little bit left over from my mittens, I was thinking a scarf, so I started The One Row Scarf, but I’m not feeling the love. Any suggestions?